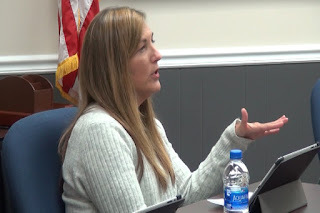 Board member Tim Burgess told Herndon he didn’t understand what remaining concerns she had, following her appearance at the regular Board meeting last month when she first spoke about mold and mildew at the elementary school. Board Chair Tom Odom said he had sent Herndon two letters responding to the issues she had raised. With that, Odom thanked Herndon for her appearance before the Board and moved on to other business. Herndon, a moderator of the Facebook group, Parents Improving Oconee Schools, raised the issue of mildew and mold in Oconee County Elementary School at the Board’s regular meeting on Oct. 15. Herndon lives at 1020 Echo Trail, outside Watkinsville. The demands were for full disclosure, restricted access, sampling for mold conducted by professionals, a full report of the results, a remediation plan, and follow-up testing. The Board met in a work session on Nov. 6, but citizens are allowed to speak only at regular Board meetings. So far, no other parents or teachers have come forward to support Herndon. The next opportunity would be at the Board meeting on Dec. 10. “I think it is really unfortunate that I’m having to come before you tonight, but, sadly, many questions have not been answered,” Herndon said at the meeting on Monday. “Due to the way that the cleanup has been handled at Oconee County Middle School with the one classroom in the third grade pod, it’s highly likely that contamination for the rest of the school happened and that the whole entire school needs to be tested,” Herndon said. She said an open records request showed that there have been problems with four other classrooms at the school. Burgess told Herndon that “We’ve heard a number of reports about the remediation work that was done inside the building, the cleanup that’s been done." Herndon said that pictures she had received from her open records request showed that the remediation work was not done correctly. Carpets were ripped up from the floor, she said, and the room was not sealed off before the work was done, allowing air from the contaminated room to escape into the remainder of the building. “We also have reports from the open records request that there have been reports of mold and issues–big issues of mold being all over the carpet or in books in multiple parts of the building,” Herndon said. County tax records show the building was constructed in 1968. Parrish said “I was informed about this pretty early on by a parent who had a child in the classroom that was affected. “At that time, I also reached out to Dr. Branch, to get an update on the situation,” Parrish said. “And that was pretty early on in the process. “But I just wanted to say to staff and to everybody, I guess, that I stressed to her, and anybody that asked me, is that I have complete confidence in the staff. “I never for a moment would think that the well-respected professionals, respected beyond our borders, would do anything to put a student or a staff member at risk in our community. Odom told Herndon he had sent her two responses to address her concerns. Anisa Sullivan Jimenez, director of Communications for Oconee County Schools, provided me with a copy of a letter Odom had sent to Herndon on Oct. 23, following Herndon’s presentation to the Board on Oct. 15. Mold and mildew are both fungi, but mildew is more easily treated. Jimenez said that was the second letter Odom was referring to when he told Herndon he had written her twice. Oconee County Elementary School Principal Ashley Templeton sent a letter on Oct. 24 to parents and staff to tell them that the school has not had a problem with mold. Templeton said in the letter sent to parents and staff that repairs had been made to a third grade classroom after a leak from a clogged drain in a heating, venting and air conditioning unit had been discovered. Ceiling tiles and carpet were replaced in the classroom, which was “thoroughly cleaned of any mildew that was present due to the leak,” Templeton wrote. Templeton said that the air quality of the classroom has been tested and found to be normal. In the letter, Templeton stated that “there is no mold issue” at the school. Herndon had signed up to speak at the meeting on Monday and was allotted three minutes to address the Board. Odom read what he called a “protocol” advising speakers that the Board may or may not respond to what is said. Burgess, first, and then Parrish, opted to speak once Herndon had finished. They were followed by Odom. Members Kim Argo and Wayne Bagley did not comment. This video is of that meeting. Odom began reading the protocol for citizen comment at 25:35 in the video. Herndon began her comments at 26:16. The comments of Burgess, Parrish and Odom followed. OCO: BOE 11 12 18 from Lee Becker on Vimeo.